The next Washington Youth Tour will take place June 13-20, 2019. 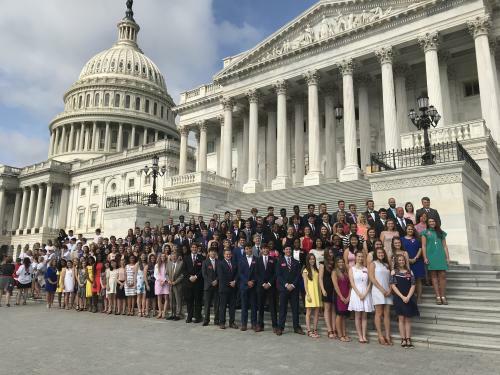 High school juniors and seniors who reside on NGEMC lines may apply to attend Washington Youth Tour (WYT), an all-expenses-paid trip in June to our nation's capital. Applications will be available on this website in the fall. WYT is a leadership trip sponsored by North Georgia EMC and other electric membership corporations across the nation. It is designed to teach students about U.S. history, the role of democracy, the importance of community and public service and the need for civic leadership.​The students will join cooperative delegates from across the country in Washington, D.C., where they will meet congressional leaders, learn about the history of our nation and electric cooperatives, and build leadership skills. A selection committee reviews the applications and then invites a group of finalists to participate in interviews. Delegates are chosen through an application process based on scholastic achievement, community and school involvement, and interpersonal and interview skills. Chosen delegates will travel to Washington D.C. with other WYT delegates from Georgia. Georgia’s delegation includes about 100 students selected by electric cooperatives from across the state. In Washington, the students will join about 1,500 other WYT delegates from all over the nation. Students attending the Youth Tour take advantage of the relationships Georgia’s EMCs have spent years building with our state and national leaders. Youth delegates will have one-on-one conversations with Georgia’s U.S. representatives and senators, while learning about the important role that electric cooperatives play in the history and progress of our nation. The application for WYT 2019 is now closed. The Howard Baker Memorial Scholarship is offered every fall to high school seniors who live with an NGEMC member. The student must attend school in the same county where he or she lives. The scholarship is awarded to one senior in each of the seven counties served by NGEMC. These counties are Catoosa, Chattooga, Floyd, Gordon, Murray, Walker, and Whitfield. Applications will be available on this website in the fall. This scholarship was named after former NGEMC director and co-op pioneer Howard Baker. Baker represented Chattooga County on the NGEMC Board of Directors from 1949 to 1996 and was instrumental in bringing TVA power to Northwest Georgia. In 1935, as Extension Service farm agent in Dade County, farmers sought his assistance in obtaining TVA power for their farms and homes. On April 6, 1936, he was with delegates at Chattanooga when TVA officially organized and named North Georgia Electric Membership Corporation. In 1949, Baker began his service as NGEMC director and served as assistant secretary-treasurer from 1971 to 1972; secretary-treasurer 1972-1992; and as board president from 1994 to 1996. At his retirement in 1996, he had served 47 years on the board. In 1984, he was presented a "Pioneer Award" by Georgia EMC for his years of service to rural electricity in Georgia. The Walter Harrison Scholarship is offered through NGEMC in partnership with Georgia Electric Membership Corporation (GEMC). The application will be available on this website in the fall. The scholarship is available to high school seniors who have been accepted to an accredited Georgia college, university or technical school or any undergraduate student currently enrolled in an aforementioned school. This scholarship was created in 1985 to honor the late Walter Harrison, a pioneer in bringing electricity to rural Georgia. The Walter Harrison Scholarship Fund is financed through donations from Georgia’s EMCs and other associated organizations. Harrison was instrumental in beginning Planters EMC in his hometown of Millen and helped to begin the EMCs’ statewide service organization, GEMC, where he served in various capacities from 1941 to 1975. Harrison also served on the National Rural Electric Cooperative Association’s board for 31 years including two years as president of the organization. Students and teachers in the North Georgia EMC service area can take a trip to PowerTown, an electrical safety demonstration that can be shown to area school groups, churches, civic groups and community organizations. In many ways PowerTown is like your town. Cars travel the roadways; people work in their yards; children fly kites. Everything runs smoothly. However, life can get dangerous when the residents of PowerTown are careless around electricity. Using a variety of different scenarios, the presenter teaches children about the path of electricity and how to stay out of that path. Audiences will also hear important tips about energy efficiency. To set up a PowerTown demonstration, follow the link below or call your nearest NGEMC office and ask for Energy Services. EnergyRight® Solutions for Youth (ERSY) is an energy education program for schools and community youth service organizations. Developed in partnership with the Tennessee Valley Authority, ERSY aligns with state learning standards and teaches children in third through fifth grade about the environment and how to use energy wisely. Teachers, parents and leaders of youth programs can use the program, which includes a complete handbook of lesson plans with experiments, games and interactive activities. Simply click the links below to download materials and lesson plans.